“I see Muda, Mura and Muri everywhere“. For the past couple of days, I have been reading about Toyota Production System and am in awe of this new field of knowledge. Taiichi Ohno, a former Executive Vice President of Toyota Motor Corporation is credited with conceptualizing this new System. Some of the concepts such as Muda, Mura and Muri have ubiquitous application potential. The meaning of these terms are further explained by Toyota Blog Site. Having learnt about the concept, I have tried to write about these concepts more generally and relate to my area of work vs. in the context of production that this was originally conceptualized. 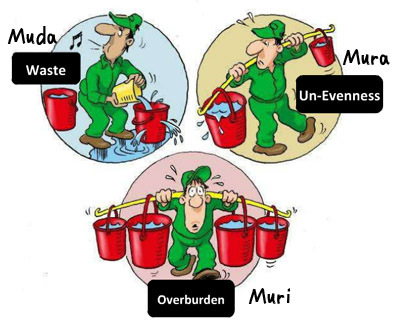 In the context of waiting in Costco, there was Mura (customers with uneven volume of purchases) that caused Muda (long wait times) and resulted in Muri (overburden on the cashier) eventually creating a frustrating experience for the customer. In Rigveda, an ancient Sanskrit collection of hymns, there is a hymn – “Aano bhadra krtavo yantu vishwatah” which means “Let noble thoughts come to me from all directions”. Literally noble thoughts and learning came to me while waiting in line at Costco.